← Is running really 90% mental? I stand accused of having become too negative. Me, little Miss Glass-half-full. Me, who sang Bing Crosby’s song, Ac-cen-tu-ate the Positive, to my university’s former VP Finance, encouraging him to stop spending so much time dwelling on the negative side of things (which in that job, admittedly, was understandable). What happened to me? I think we all know. It’s a modern disease that results from spending too much time reading or listening to news and wondering how the world got to be such a mean, angry place, even among people who have no personal complaints. It’s a disease that has infected all of us who had naively thought that beneath all the rancor there were people in charge who believed that kindness and decency to all were accepted aspects of living in a civil society. But, it turns out that from time to time some of these assumptions are sorely tested, and, sadly, this is one of those times. And news junkies like me, who have 24/7 access to over-the-top stress-inducing world news thanks to our advanced technologies, are left in despair over the state of the world. And despair for the world, it turns out, does have an impact on one’s usually positive attitude! I haven’t lost my positive attitude about my own life, the lives of my family and friends, or my corner of the world. Not in the slightest. But apparently my preoccupation with the extraordinary disruption of 70 years of an integrated and cooperative world order has coloured my overall tone. I guess it makes some sense than in posting articles on FB that bemoan the current state of the world, albeit with compelling arguments ;), I have been perpetuating the stress-inducing despair that has turned me negative. Hmm. I’d better do something about this. Time for me to take my own advice. In googling “positive attitude” you can find lists of 11 tips to create and maintain a positive attitude, 18 tips, 21 tips, 7 tips, 8 tips, or even 100 tips. Take your pick. I’ve made my own list of just 3 tips for restoring and maintaining my own positive attitude. I don’t know about you, but I’m more likely to have success with three tips than 11, 18, or 100. A lot easier to remember, for one thing. 1. Don’t become overwhelmed by problems that you have no possibility of changing. Concentrate on what you can help change. Things we can change: Depending on your particular concerns, as long as you’re living in a democracy one thing you can do – and should do – is to be sure to vote. Volunteer in elections if you have strong feelings about what’s going on where you live. Every voice should count. Also, of course, there are many politics-free volunteer activities you can get involved with to help make your community, region, or country an even more caring place. Things we cannot change: I can’t change the US becoming a more insular and less civil society, nor can I change the lose-lose situation of Brexit. “Things I cannot change” is a long list. I need to stop spending so much time reading world news and spend more time on positive, constructive activities. 2. Remind yourself that your attitude has an impact on others. 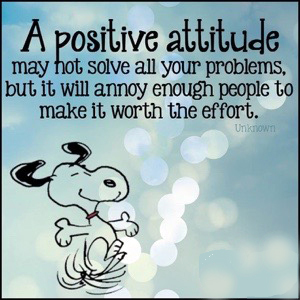 This recommendation appears on most lists of tips for maintaining a positive attitude. I tried something like this a few years ago. 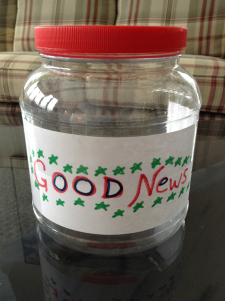 I read about someone who kept a Good News Jar, into which the author inserted slips of paper that described good news each time there was something to celebrate. I think I was setting the bar too high for this to work. My problem was that I was looking for good news for the world rather than good news in my own life, and my jar only contained two pieces of paper at the end of the year! I think I need to take a leaf out of the book – I mean blogs – of some bloggers I follow. LA at Waking Up on the Wrong Side of 50 has a post every Saturday called Gratitude Saturday. I don’t think I need to necessarily post my gratitude highlights each week (although that’s a good motivator for actually going through the process), but recording what you’ve been grateful for each week has to be a good thing. Who knows, it might even include good things happening in the world! Tim and Joanne Joseph at A Note From Abroad end every post with a short section called Gratitude Moment, where they describe what they’re grateful for from that day. I always look for it. Lilie at Tea and Toast with Kindness, a poet in Montana who, like Cynthia, lives with chronic pain. Lilie posts beautiful poetry that speaks to everyday experiences. But every once in a while she also writes about her struggles with illness and chronic pain, and through her descriptions shine her strength and positive approach to living her life on her own terms. She is another inspiration about gratitude and defining your life around what you can control, as opposed to what you cannot control. 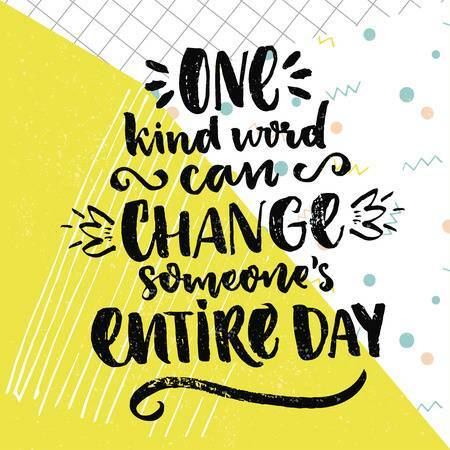 So, I have been learning from fellow bloggers about impactful ways to reflect on the positives in life and to express your gratitude for them. Now to put those lessons and ideas into practice. This doesn’t mean that I’ve lost my desire to help make the world a kinder place, but I have been reminded that there is nothing stopping me from doing this in my own backyard. P.S. Having said all this, in looking for the picture of my Good News Jar, I just came across it in my blog post from New Year’s 2016, entitled Resetting the Optimism Button for 2017. Very similar sentiments to what I’ve just written. It seems I’d better try harder! This entry was posted in Odds and Ends and tagged blogging, control over your life, gratitude, happiness, impact on others, kindness, news, politics, positive attitude, serenity prayer, wolrd news. Bookmark the permalink. 23 Responses to Help, I forgot to ac-cen-tu-ate the positive! Lol. That’s a lot of reading ahead of you, Alesia. Btw, happy birthday!!!!! Ahhhh Thank you! Yes it is. I have been doing a ton of research on some genealogy projects so that has taken all my time! Yes, we must think positive, although it is difficult to avoid the craziness happening in our country every time you turn on the television. However, I feel I can still make a difference. And THAT I feel is a positive way to live. I would be consumed with disappointment if I didn’t work to vote out the negative forces in Washington. So, I fight on with my friends, and we try to make changes so this world is a better place for our grandchildren. We didn’t expect to be protesting in our late 60’s (for many of the same causes we fought for in college). But, we did it then and we can do it now. After all, fighting for our freedom is right, and that alone brings us peace and joy. And what could be more positive than that??? We all can make a difference if we try. Great post! What a wonderful and gratifying response. Bravo. That’s what democracy is supposed to be all about, with every person having an equal voice. But it’s up to each one of us to use our voice. Too many of us became too complacent. You’re dead right. We all need to feel that we can make a difference. Thanks for your comment. Fingers crossed that kindness will prevail in the end, everywhere. Oh I hope so. I truly think we can get back to kindness. For 36 years I taught my student through kindness and I hope it rubbed off. If we can make it through the next few years I think we have a great shot at regaining decorum, kindness, and elected officials who speak with eloquence and knowledge. Great three points. And the serenity prayer. Serenity prayer, indeed. I think we need it more and more frequently as the world becomes crazier and crazier! Thank you, Jane. Thank you for your thoughts, and thank you for the mention. You make a difference with the truth, the truth told in respectful, straightforward ways in less than civil times. You make people who want to believe in that kindness, civility, intelligent discourse feel heard and possible. We make a difference. We change things when we grow. Thank you, again. This is funny, Jane. I’m here reading your post and thinking: “What a great article Jane has written. I must tell her, but let me keep reading to see what more she has to say.” And then I see my name in your post. You, my dear, just uplifted me by deeming me worthy of inclusion. so I’m sending you a hug of thanks. Oh how I share your sentiment. Like your comment above, I stop following people on Social if they are too “passionate” about a negative position even if it is one I feel myself. I’ve seen quite a few people announce a leave of absence from Social for this reason and treat it like detoxing from any addiction. Great post. I’m sure we could come up with some general guidelines. If only we could get others to “mind” us!? A sportswriter I read ends his blog posts with “And tomorrow will be better than today”. Friday night I got to see and hear Mavis Staples sing. That is a woman who sees the positive in people! The greatest singer to ever play harvest. It was a beautiful day in New Brunswick today. Catriona and the FHS girls soccer team won their tournament. And tomorrow will be better than today. I still read blog posts, still have Facebook (but absolutely do not read the stuff that stirs me up) most of my facebook feeds are related to gardening, living on an acreage, etc. and all of the people that post anything testy are not visible. Just curious, did someone say something or what made you aware of the shift in your attitude? Lol. You are so good at getting to the heart of things, DM! Someone I think very highly of told me that he looks to me to remind him of the positive side of things when need be, and that he was concerned that I was losing that ability. Yikes! Time to change. Another tip is to block the people on Facebook that continually post negative posts. Thanks for adding this, Diane. This is definitely relevant for me. That’s where a lot of the news comes from these days, and it wears you down after a while, even when you agree with it!